Hindustan, with part of Cabul. 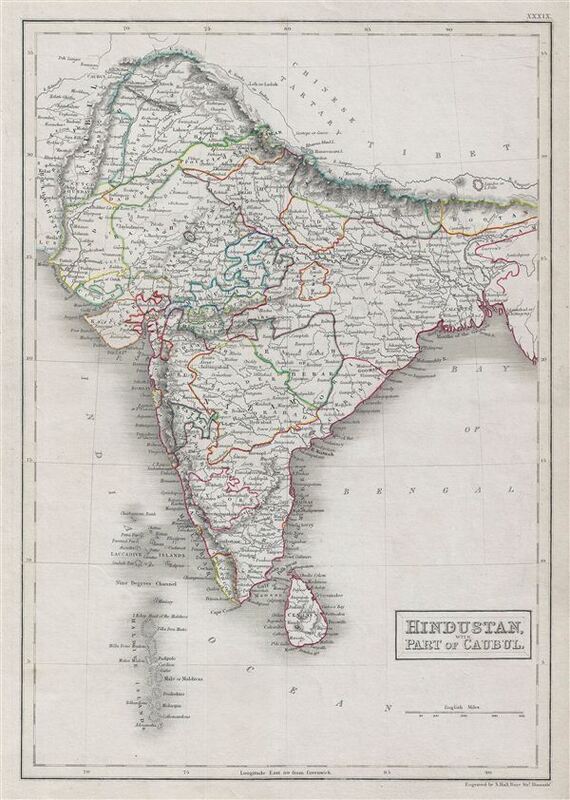 A fine example of Adam and Charles Black's 1840 map of India. The map covers the Indian subcontinent from the Hindu Kush mountain range to the Indian Ocean. It also includes the Maldive Islands, the Lakshadweep Islands, Ceylon and parts of Kabul in Afghanistan. During this time in history, the Indian subcontinent was ruled by the British east India Company. The east India Company ruled India until 1858, after which it was governed by the British Raj till it finally gained independence in 1947. This map was engraved by S. Hall for issue in the 1840 edition of Black's General Atlas. Rumsey 2305.045 (1854 edition). Philips (atlases) 4334.